Hi guys! Katie & Ryan here to show off one of our gorgeous Peach Creek Ranch couples. We love highlighting our amazing couples, photographers, and vendors that we have the pleasure of hosting out at Peach Creek Ranch. Chanel and Jon brought a lot of love, fun ideas, and awesome vendors out to our venue on their wedding weekend, so it only makes sense that they are our featured wedding for this blog post! All images featured in this post were taken by their AMAZING photographer, John, at All Heart Photography. The day was coordinated by our super star coordinators at All Things Planned. Chanel and Jon Hicks were married on May 13th, 2017. It was a magical day full of love, joy, and laughter. Chanel and Jon were the sweetest couple and it was so evident how much love they shared. The weekend was magical from beginning to end, and it began on Friday when the lovely couple and their family and friends began decking our venue out with the their decor, followed by a rehearsal dinner out at Peach Creek Ranch. We love all of the personal touches and adorable ideas Chanel and John brought to their wedding day! Adventure truly does await these two! Write a letter to the bride and groom! On the morning of their wedding, the soon-to-be Hicks love birds spending their morning in our bride and groom cottages. Chanel and her girls got ready in our bride's cottage while Jon and his guys played poker and pool in our groom's cottage/man cave. Chanel and her lovely ladies snap a shot on the morning of her big day. Her girls were total super stars! We love this classic up-do styled by one of our favorite hair & makeup artists, Makael Pritchard. These adorable robes made these getting-ready shots way too precious! 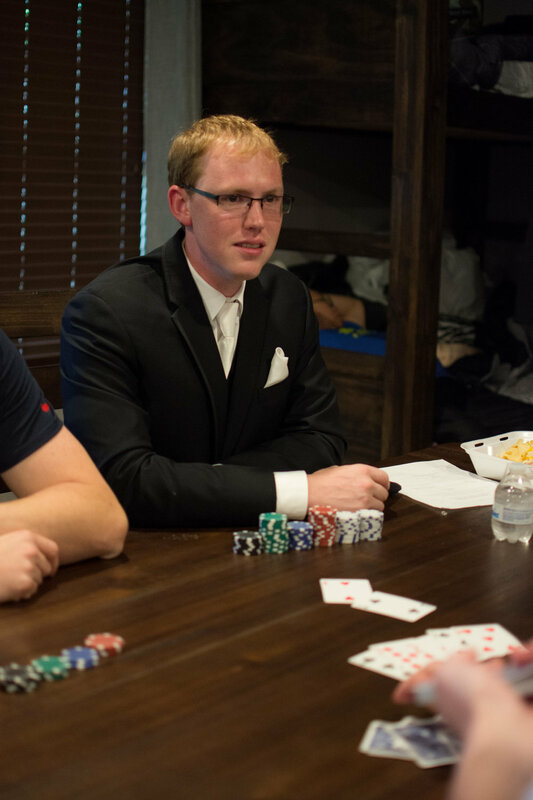 The boys play poker to ease some nerves. We love cute shots like this! Our pool table keeps your groom busy while you get pampered on your big day. After Chanel and John were ready to get hitched, they had a beautiful service at St. Mary's in College Station. On their way back to Peach Creek Ranch, they made a quick stop on campus to take a few classic picture under the Century Tree. Aren't these Aggies way too precious?! The Century Tree on Texas A&M University's campus is very special to the students and alumni. 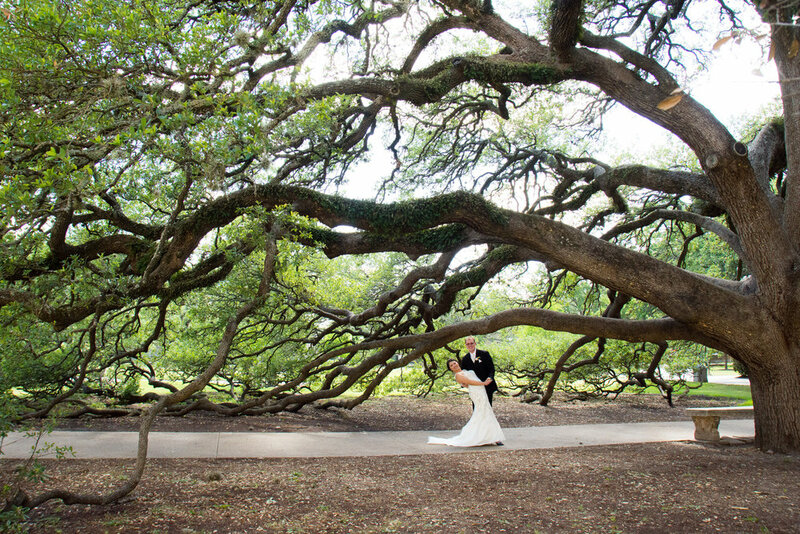 Tradition says that if a couple walks under the special tree, their love will last a lifetime. We have no doubts about the Hicks. Then, it was back to Peach Creek Ranch to party the night away! The newly wedded Hicks and their guests brought the fun to their reception. Guests were constantly dancing, the music was bumping, and Chanel and John were living it up on their first night as a married couple. It was such a lively night celebrating such a lovely bride and groom! Texas Best Selfie brought the sparkle with their super fun photobooth! Fabulous Flare made a truly fabulous cake! Even though the party was poppin', Chanel and John managed to sneak away for a moment to soak it all in as they sat by the lake and took some unforgettably gorgeous photos. These moments were surely the sweetest of the night. 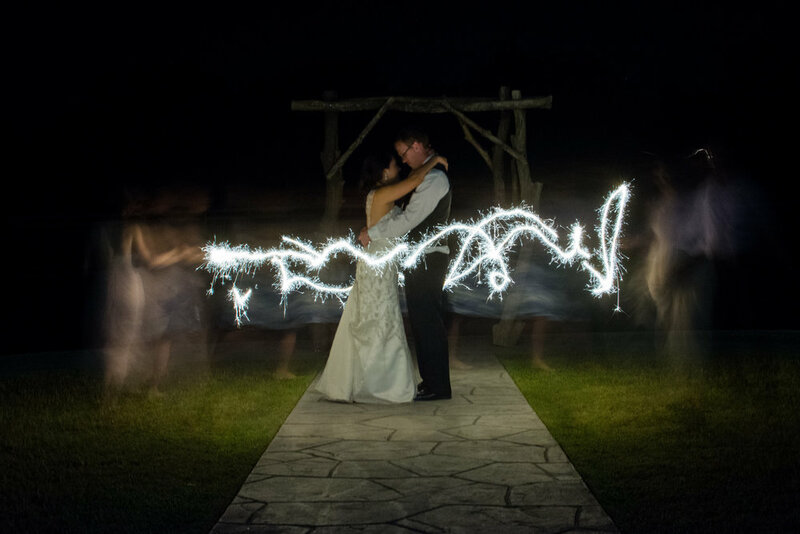 We always hope our Peach Creek Ranch couples are able to take a break to appreciate the wedding and the love they have created. We love that Chanel and John got to share these precious memories. Then, it was back inside to finish the night with a last dance and a classic sparkler send off. 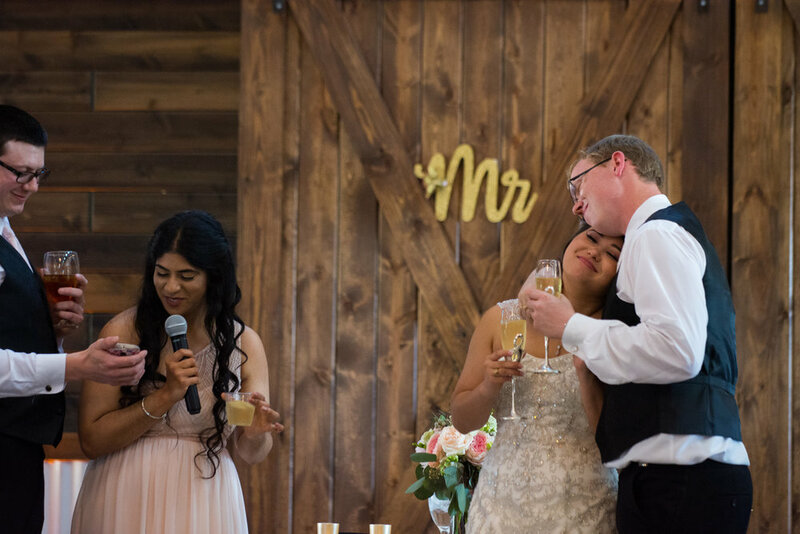 After their wedding, we reconnected with this lovely couple to check in, and our hearts were overflowing with the love they gave to us and to Peach Creek Ranch. "We signed with PCR before construction had really begun! We instantly fell in love with Katie, Ryan, and their dream. Trusting them was the best thing we could have ever done in planning our wedding. Our Wedding Day was BEYOND perfect! Every detail was captured, and our day flowed stress free. Katie referred us to reliable vendors and was always an email away if I was unsure of anything. Being a type A bride, I put a lot of effort into planning and I know my planning would was only as good as PCR's ability to follow through. Everything stayed on schedule and nothing that I wanted to do was forgotten. The PCR team are friendly, personable, and reliable. They made sure my needs, and our families wants were taken care of. Everyone had a wonderful time and also fell in love with our venue. It provided a great space outside for kids and adults to just relax. I remember seeing the finished PCR, and every time I visit it still takes my breath away. PCR is a wonderful space filled with southern charm, surrounded by nature's beauty, and built on Aggie hospitality! PCR gave us the PERFECT Wedding Day!" None of this would have been possible without Chanel & John's awesome vendors. We want to thank them all for doing such an amazing job! Thanks so much for checking in with Peach Creek Ranch and reading our blog about Chanel & John! Check back soon for our next wedding in our Real Wedding Series. Until next time, stay peachy!